River Stone Cottage on River Stone Estate Winery in the heart of wine country. Quiet, rural 2 bedroom house on vineyard in heart of wine country. Can you imagine a better way to experience wine country than in an original farm house surrounded by vines? River Stone Cottage is a quaint two bedroom house with a fenced yard, large deck and shade trees located on River Stone Estate Winery. 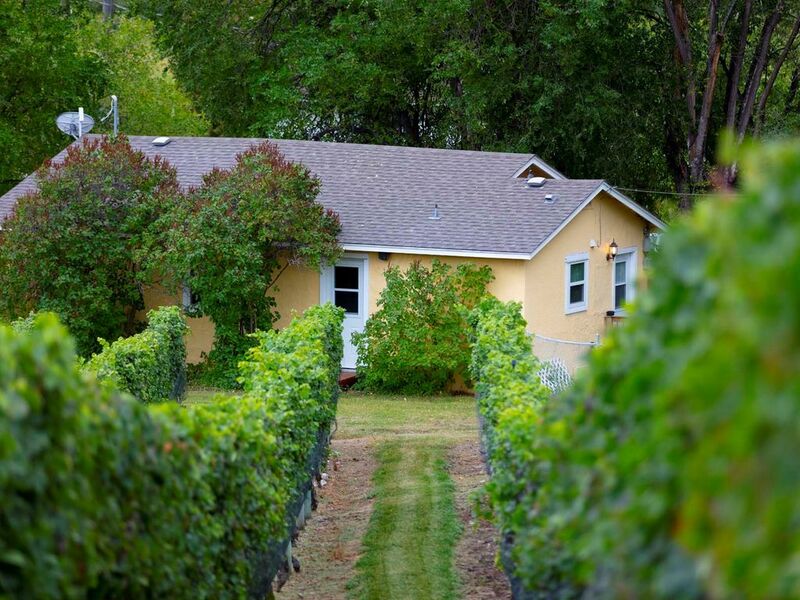 It is conveniently located a short walk through row #83 from the main house, winery site and tasting room. Our 9.5 acre vineyard boarders the Okanagan River which is great for walking, biking, swimming or fishing. Nearby you can find several golf courses and other quality wineries. We are Ted and Lorraine. We purchased this land and planted a vineyard, are raising three kids and have developed a winery. Great soils for growing grapes. Lovely little town with lots of potential. One window shaker that is installed in living room. Baseboard heaters with thermostats - please keep these clear. Fully equipped kitchen with full stove, oven, fridge, dishwasher, coffee maker, coffee grinder, blender. In kitchen eating area that can sit 6. Deck is large and has a patio table and four chairs. In kitchen eating area that can sit 6. Deck is large and has a patio table and four chairs. 2 additional lounge chair and there is a large picnic table on lawn that can be moved to deck. Have a canoe for use on local lakes if you are able to transport it and have own life jackets. Great location for exploring wineries on the Black Sage rd and others in the south Okanagan. Comfortable furnishings, clean. Lovely trees. Spent 5 wonderful days here and my only complaint is it wasn't 7 nights! We arrived at the wine shop to pick up the keys and were immediately welcomed by the lovely ladies who were serving that day. We did a tasting before heading to the cottage with 6 bottles of wine and a wine club membership in hand. The patio was the perfect spot to sit and sip a cool glass of rose watching the dog run around the fenced yard. I didn't realize there was A/C, which was a very welcome surprise! The kitchen has everything you could need and more plus, the bedrooms and bathroom were lovely with ceiling fans in each room keeping the cool air moving. I can't say enough good things about the cottage, the wine and the yard. Cannot wait to go back! We absolutely loved our stay at the River Stone Cottage. The cottage had everything we needed for our stay. It was clean, comfortable, quiet, and in a great location. Our hosts were very hospitable and always available if we needed anything. We had a lovely time chatting with them and getting to know a little bit of history about the vineyard. They were also great about suggesting other vineyards to try in the area. We wouldn't hesitate to recommend River Stone Cottage to anyone, and are already planning our next trip back! A cute little cottage and very well stocked. It was so quiet, peaceful and only minutes from wonderful river walks. A nice rural location by the vineyards but still very close to Oliver and amenities. The hosts were lovely and welcoming. We really enjoyed our mini getaway at River Stone Cottage, even though the weather wasn't great during our stay the cottage is really cozy. Everything you could possibly need is provided and then some. We didn't get a chance to meet Lorraine, but Ted was very welcoming and made sure we had everything we needed. We would definitely recommend this property and look forward to a return trip ourselves. Booked this cottage in search of some sun after a rainy Vancouver winter. Perfect place to relax for a few days. Deck was large and sunny and the fully fenced yard was a bonus for our dog to play in.